Matthew W. Elchin, a Cambria County Native, is one of our newest additions to the Laurel Highland’s team. He was inspired early in life by his brother and neighbor to pursue medicine. He attended Saint Francis University in Loretto, PA to gain his Bachelor of Science in Health Science in 2001. He also earned his Master of Physician Assistant Sciences there in 2002. 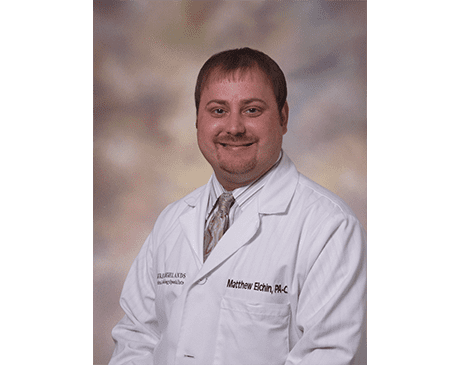 After graduating, Matthew started his career as a gastrointestinal physician assistant at Gastrointestinal Consultants in Johnstown, PA. He’s currently an Interventional Radiology Physician Assistant at Laurel Highlands Interventional Specialists in Johnstown, PA.
Matthew’s experience ranges from interventional radiology treatment and evaluation and gastrointestinal evaluation to the interventional treatment of varicose and spider veins. Matthew can be found back at St. Francis giving lectures and inspiring others. He’s recently been married, and enjoys spending the majority of his free time with his new wife, improving their new home in Johnstown. Cambria Somerset Radiology accepts most insurances, including Medicare, Highmark, UPMC, and Aetna. Please contact the office for additional information on accepted insurances.